Two thousand years ago, an itinerant Jewish preacher and miracle worker walked across the Galilee, gathering followers to establish what he called the “Kingdom of God.” The revolutionary movement he launched was so threatening to the established order that he was captured, tortured, and executed as a state criminal. Within decades after his shameful death, his followers would call him God. Sifting through centuries of mythmaking, Reza Aslan sheds new light on one of history’s most influential and enigmatic characters by examining Jesus through the lens of the tumultuous era in which he lived: first-century Palestine, an age awash in apocalyptic fervor. Scores of Jewish prophets, preachers, and would-be messiahs wandered through the Holy Land, bearing messages from God. This was the age of zealotry—a fervent nationalism that made resistance to the Roman occupation a sacred duty incumbent on all Jews. And few figures better exemplified this principle than the charismatic Galilean who defied both the imperial authorities and their allies in the Jewish religious hierarchy. Balancing the Jesus of the Gospels against the historical sources, Aslan describes a man full of conviction and passion, yet rife with contradiction; a man of peace who exhorted his followers to arm themselves with swords; an exorcist and faith healer who urged his disciples to keep his identity a secret; and ultimately the seditious “King of the Jews” whose promise of liberation from Rome went unfulfilled in his brief lifetime. Aslan explores the reasons why the early Christian church preferred to promulgate an image of Jesus as a peaceful spiritual teacher rather than a politically conscious revolutionary. And he grapples with the riddle of how Jesus understood himself, the mystery that is at the heart of all subsequent claims about his divinity. I am truly conflicted about this book. On one hand, there is much to recommend it. On the other hand, I feel that Aslan missed his mark on many points. One of the best things about this book is Aslan's skill at recreating the world of first century Palestine for the modern reader. Israel/Palestine/The Holy Land has never been a place of calm, but it may have been at its most chaotic during that time (even more so than the modern day). 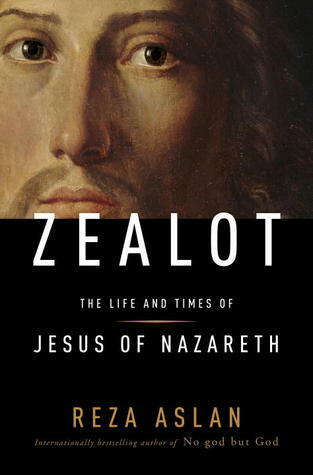 I've read many books about the history of Jesus and Zealot is the first one I've come across that takes the time to explain the world of Jesus as Aslan does. Another area where I think Aslan excelled was in his discussion of the theological battles between James and Paul. I don't quite agree with all of his claims, but it was one part of the book where I learned something new and it did leave me with a new outlook on some of the Epistles. For the most part, Aslan has a very readable style. I have a high tolerance for "academic" writings, but I really felt that Aslan wrote at a level that most people would find accessible--most of the time. There were about 4 or 5 sections of the book where Aslan allows himself to get so bogged down with details that I had to keep referring several pages back to see what his original point was. All that being said, I found some serious flaws with this book. When a book is written about any historical and religious figure, there is a very thin line the author must walk. There have been authors who have successfully navigated this when writing about Jesus (Marcus Borg is one that comes to mind), but Aslan trips spectacularly over that line with his own assumptions that he fails to back up with any sort of actual proof. There were three instances that really stuck out to me, which I will address in reverse order. The last of these was when it came to Saul/Paul and his conversion experience. Aslan's argument is that it never happened--it was a creation of Luke when he wrote the book of Acts. Aslan argues that it must not have happened because Paul never talks of it. First of all, that's not exactly true. While Paul does not precisely recount the incident, he alludes to it several times in his letters. Secondly, why would Paul write about it? He's not writing a record of his life. He's writing letters to congregations who have met him and know about him and would definitely have been aware of his conversion experience. Not only do I believe Aslan to be incorrect on this point, but he uses his assumption as fact. The second instance is in reference to the Resurrection. Aslan states that it is a matter of faith and can not be proven in history--which is completely true. But he then goes on with the assumption that it never happened, which can't be proven either, making the rest of that section meaningless. The first instance, and the one that totally knocked me off my feet, regards the miracles of Jesus. Aslan spends little time talking about Jesus' parables and miracle. For the parables, he only addresses the ones that he can make fit into his thesis and ignores the many (and more famous) ones that do not. As for miracles, Aslan writes it of as....magic. Yes, magic. And not magic as in David Copperfield-like illusions, but honest to goodness Holy Harry Potter magic. Aslan's greatest problem is that he mistakes his own assumptions as fact. He leaves no room for the possibility of anything. When he has no proof for or against that Jesus and John the Baptist were relatives, he immediately assumes that they weren't. Why not go with, maybe they were or maybe they weren't? When Aslan says (page 121 of my ARC), "Yet if one wants to uncover what Jesus himself truly believed, one must never lose sigh of this fundamental fact: Jesus of Nazareth was a Jew and nothing more," what makes that a fundamental fact? Because Aslan says so? He also said Jesus was "magic." Ignoring what you cannot explain does not create facts, it creates opinions. Beyond the "facts" of his own creation, there really isn't anything in this book regarding Jesus that I haven't read elsewhere. I do feel that Aslan's constant assertions that his assumptions are facts very quickly become patronizing to the reader, which colors the positive aspects of this book. Would I recommend this book? I don't know. If I were to recommend it, it would be to someone who I know reads with a discerning eye who would be able to separate the wheat from the chaff, so to say. I do think that there are parts of this book that are valuable, but other sections (well, the large middle section) which are questionable at best. Aslan's thesis seems to be that Christianity misses the point of Jesus. However, I think it is Reza Aslan who is missing the point. I won an Advance Readers Copy of this book through the Good Reads First Reads program. I was requested, but not required, to write an honest review. All opinions are mine and mine alone. I found your blog doing research on this book, trying to decide whether to buy it or not :) Great review of you so I'd like to know which books about Jesus you would recommend? Thanks in advance! Marcus Borg is a good author to start with. I've read several of his books and liked them all, but my favorite was probably "Meeting Jesus Again For the First Time." A lot of people also like Dominic Crossan--he and Borg have worked together--but I haven't read any of his books. Another book I would recommend is "Between Heaven and Mirth" by James Martin (it is reviewed on this blog at http://westmetromommy.blogspot.com/2012/03/book-review-between-heaven-and-mirth-by.html). It isn't a history of Jesus, but it does a good job of talking about how people in 1st century Israel/Palestine thought. Thank you! I found Borg in my country's online bookshop and ordered "Meeting Jesus" already. The other ones are probably on amazon. I read Philip Yancey's "The Jesus I never knew" many years ago and liked it a lot so it will be interesting to see if/how all these books differ. I ordered Aslan anyway, out of curiousity.